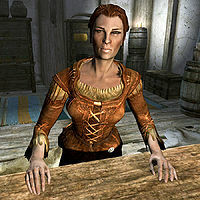 Hulda is a Nord innkeeper who owns the Bannered Mare in Whiterun. She plans on retiring soon and selling the inn to Ysolda, who is trying to save up the money to buy the inn, but this never actually happens. If Hulda is killed, Ysolda will immediately take over the Bannered Mare, but will still speak of buying the inn from Hulda. She does not go to bed, instead staying behind the counter almost all of the time. Like all innkeepers, she will sell some food and ingredients, and offers a bed for rent at a rate of 10 gold. She will also pass on rumors about quests and give bounties to complete for Whiterun's jarl. Additionally, she will buy firewood for 5 gold each, which increases her disposition and allows you to take low value items from the inn. She wears a set of farm clothes and a pair of boots. She is equipped with an iron dagger and carries a selection of common items and gold. While she is working at the inn, she will say, "I enjoy this work well enough, but I'm ready to retire. I've been thinking of selling the inn to Ysolda. Anyway, what do you need?" At other times, she will ask you,"What can I get you?" or "Hungry, tired, or just plain thirsty?" She may instead offer you to chop wood for gold: "If it's work you need, how about chopping up some wood for the fires?" or "Here for work? Get an axe and bring me all the wood you can chop." Upon ending conversation with her, she may tell you either "Need anything else, just let me know." or "I think I've got some mugs need scrubbin'." Should you meet her outside the Bannered Mare, she will tell you, "I'm just out and about, love. The Bannered Mare can do without me for a bit, I suspect. ", "I don't get much time time off from the tavern, but I enjoy it when I do. ", or "I'll get back to the Bannered Mare soon enough. Just need to stretch my legs a bit..."
While at the inn, if you sit in a chair or enter the kitchen, Hulda will say, "Saadia, wake up dear!" Saadia will reply, "Yes, mum!" and approach you to offer you a drink. Hulda will do this even if you sit on the bar stool right in front of her. If asked where you can learn more about magic, Hulda will comment, "Magic is for the weak. Elves, I mean. They keep to that College in Winterhold. They know their place. Of course there is Farengar. He might be the Jarl's wizard, but at least he's a Nord." If you are either a Dunmer, Altmer, or Bosmer, she will be even more annoyed: "Pfft, I should've guessed as much. Your kind sticks to that College in Winterhold, as well they should. You'd never think to learn from a Nord like the Jarl's wizard." You can also ask her for gossip and rumors. She may tell you about a job opportunity: "The Companions? In Jorrvaskr? They're recruiting new members, from what I hear." She may instead talk about the Gildergreen: "I assume you saw the Gildergreen? Big tree, all burnt up, in the middle of the Wind District. It's part of the Temple of Kynareth. People want Danica to do something about it, but I don't know what they expect." Alternatively, she may tell you about Balgruuf the Greater's children: "Been hearing some strange tales of the Jarl's children. Say the one's turning wicked, and the others have an ill-favored look to them. Best to keep clear." When Whiterun is under control of the Stormcloaks, you can ask her about her life under Stormcloak rule. She will tell you, "Well, the Stormcloak guards drink a lot more than the Imperials did, so I've been making more money lately. On the other hand, they're a violent bunch. Every night a fight breaks out and I end up with a smashed chair or a broken table." and end with saying, "So, not much has changed, really." Hulda "So Mikael, what'll it be tonight, hmm? Something upbeat? A Breton jig maybe?" "Mikael, son. How about something with a bit o' kick?" Mikael "Well, I was thinking maybe something mournful. A High Elf dirge, perhaps? These are rather trying times, after all." "You know, Hulda, there's this lovely Argonian ballad I've been studying..."
Hulda "You trying to scare off my customers, son? Lively! Keep it lively!" "We've been down this road before, Mikael. Save the sap and sadness for your lady friends. My patrons need life! Cheeriness!" Mikael "Hmm... Yes, you do raise a good point. What about the 'Sweet Maidenfair from Hadleyshire'?" "Alright, alright... Um... How about 'The Guttersnipe'?" Hulda "I think 'Seven Septims for Sigurd' will do nicely. Especially when they're in their cups." "Well, that's not bad. But I was thinking 'Mogo's Mead' really gets the place moving." Mikael "Well then, consider it done." "Ah! An excellent suggestion. I'll do that one, then." Hulda "Don't forget to polish those glasses later." "You still need to remove that blood stain. From the... incident." "Just a reminder, sweetie - the blankets still need to be washed." "We're running low on the Black-Briar mead. In a couple days I'll have you make a run, fetch some more." "I'll be needing you to mop the place down extra tonight. Lots of spills!" "Oh yes, mum. I'll make sure it gets done." If Hulda dies before you receive the rumor for the Whispering Door, you may be unable to start the quest, due to a bug with Ysolda. As part of an unfinished quest, you could have delivered a case of Frost River mead to either Saadia or Hulda, who will reply, "Ah, good. I've been waiting on that. Here's the gold for it. Thanks." Like the other residents, she will never mention that Saadia is gone as a possible result of your choices in her quest. This page was last modified on 20 April 2014, at 18:49.